China and India both succeeded in slashing poverty in the decade from 2001 to 2011. But while that contributed to a rapidly growing middle class in China, it did little to increase the number of Indians who could be considered middle income, according to a new Pew Research Center analysis. From 2001 to 2011, the share of Chinese who are middle income jumped from 3% to 18%. But the share of Indians who are middle income was almost unchanged, inching up from 1% in 2001 to 3% in 2011, the latest year for which data are available. Shanghai’s gleaming skyline and the ubiquitous “Made in China” tag are among the visible symbols of this economic divide. According to International Monetary Fund data, China is now the world’s largest economy, producing 16% of all goods and services, whereas India accounts for only 7%. As recently as 1991, China and India each accounted for about 4% of global output. The two Asian neighbors, while both demographic giants, appear to be on different trajectories. The Pew Research study, which covered 111 countries, divided people in China and India into five income groups: the poor (who live on $2 or less daily), low income ($2.01-10), middle income ($10.01-20), upper-middle income ($20.01-50), and high income (more than $50). These figures are expressed in 2011 purchasing power parities and 2011 prices. In annual terms, the middle-income range translates to an income of $14,600 to $29,200 for a family of four. The one shared achievement between the two countries was their success in cutting the poverty rate. From 2001 to 2011, the poverty rate in China fell from 41% to 12% and the poverty rate in India dropped from 35% to 20%. That moved 356 million Chinese and 133 million Indians out of poverty, or 489 million people in total. This is almost three-quarters of the number of people that emerged from poverty globally. 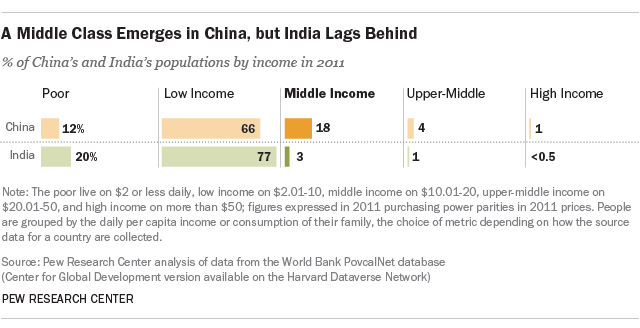 China was more successful than India in pushing its population closer to a middle-income lifestyle. The transition out of poverty resulted in an increase in low-income Chinese, with their share in the population rising from 57% in 2001 to 66% in 2011. But the share of middle income grew by even more, from 3% to 18%. Also, the share of China’s population that is upper-middle income or high income climbed from less than 1% to 5%. By contrast, the transition out of poverty in India mainly resulted in an increase in the share of its low-income population, from 63% in 2001 to 77% in 2011. The middle-income share rose only from 1% to 3%, and about 1% of India’s population is estimated to have had an upper-middle-income or high-income standard of living in 2011. China has pulled away from India in part because it initiated economic reforms in the late 1970s, more than a decade before India launched its own reforms in 1991. China’s economic reforms are also seen as deeper and more far-reaching, resulting in superior trade and investment outcomes. But this is not necessarily unmitigated good news for China. Research shows that rising prosperity in China is going hand-in-hand with rising inequality. There is also concern about a stock market bubble in China and what it might mean for the country’s near-term economic future. On the other hand, there is guarded optimism that India may push further forward economically under its new government. Other estimates of the size of India’s middle class suggest that it may account for between 5% and 10% of its population. (Although these estimates use the same $10 threshold for entry into the middle class as the Pew Research study, they extend it to encompass people living on as much as $50 per day and also draw on other data sources.) But for the moment, a sizable gap remains between the economies of China and India.